Motor vehicle offenses in Massachusetts can vary from minor misdemeanors to serious life altering felonies. Regardless of what motor vehicle offense you are facing, you need and deserve experienced representation. Having a skilled attorney on the case can help minimize the impact a motor vehicle offense may have on your life and your record. Massachusetts criminal attorney Stephen M. Forlizzi has 30 years of experience helping clients get the best resolution for their motor vehicle offense cases. A motor vehicle offense of any level can result in high fines, loss of license, and jail time. Insurance premiums are also affected when someone is found guilty of a motor vehicle offense. A conviction or loss of license can impact your job, especially if you need to drive a company car. The fines and jail time can impact your wallet, reputation, and take a toll on your family. A felony motor vehicle offense can greatly alter your employment outlook even after you pay your debt to society. There is too much at state to not have the trusted advice and guidance of the Law Office of Stephen M. Forlizzi on your side. Our firm will investigate the details of the offense, collect evidence, and present your side in court if necessary. Our negotiating skills can help increase the chance of getting the offense reduced or even help you protect your driving license and record. It is important to be prepared for the possible outcome of a motor vehicle offense case. It is also just as important to have a legal advocate you trust on your side throughout the entire process. 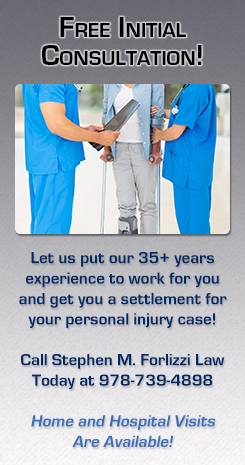 Call the Law Office of Stephen M. Forlizzi for a free consultation about your case. Having us on your side can make all the difference in your case now and the impact it may have on your future. For a Free case evaluation on your motor vehicle offense Call - 978-739-4898 or Contact Us By E-mail Click Here.